Card's inside greeting reads: Happy Birthday And Many Happy Returns. 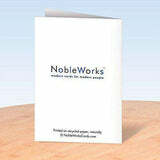 Founded in 1980, NobleWorks â and The Best Card Company, its non-humor division â is an award-winning brand and a New Jersey based, family-owned publisher. A proud board member of the Greeting Card Association, we strive for 100% perfection and customer satisfaction â every card, every order, every time. We are here to serve whether you purchased our stationery directly from us or from authorized resellers.